So, if you didn’t know, this week is National Katsu Curry Week! It seems perfectly timed, what with all this cold weather and the dark nights looming in. A bowl of hot chicken curry with warming spices and spoonfuls of rice sounds just about wonderful right now. We’ve teamed up with Yo! Sushi to help you create their gorgeous Super Mega Katsu Curry at home! What makes their katsu curry so super I hear you ask? Well, their curry consists of deep fried chicken covered in Japanese breadcrumbs and served on a bed of rice with a mild but rich Japanese curry sauce. Yum! With this curry selling nearly 1 millions plates a year in Yo! Sushis across the nation, we can’t quite believe they are letting us have this secret, delicious recipe! Season the chicken thighs with a pinch of salt and shichimi chilli powder. Place the plain flour into a bowl, crack the eggs and place them in a different bowl then whisk and place the panko bread crumbs into a third bowl. Coat the seasoned chicken thigh into the flour, then the egg and then the panko breadcrumbs making sure that all of the chicken is coated. Slice the cabbage as thinly as possible and soak in cold water for 5 minutes then drain it well. Place the vegetable oil into a pan and heat. Shallow fry the breaded chicken for 3 minutes on each side or until they are slightly crispy and cooked through. Slice the chicken into 5 finger sized pieces. Place the cabbage onto the plate and neatly arrange the chicken katsu pieces then drizzle with the tonkatsu sauce. 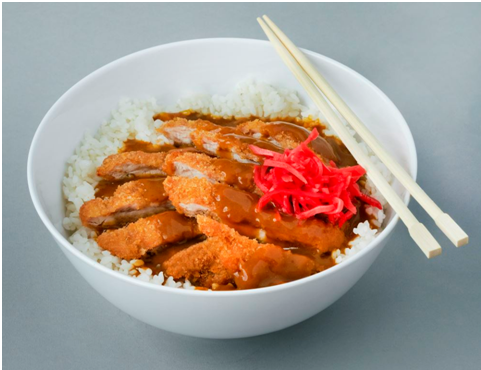 To take the chicken katsu curry to the ‘super mega’ level, just add heaps of steaming hot rice and fill your bowl to the brim! The Super Mega Katsu Curry dish is available for a limited time in all Yo! Sushi restaurants until the end of November. If you don’t have the time or patience to create this masterpiece at home, you could always pop to the Yo! Sushi restaurants in Fenwick, Newcastle or in the Yellow Mall at the Metrocentre.